Washington has asked Vietnam to prevent Russia from using the Cam Ranh Bay naval base in the South China Sea to refuel its military aircraft, Reuters reported, citing an unnamed State Department official. Describing the US request to Hanoi, the official said that Russia has reportedly increased its number of patrol flights in the Asia-Pacific region. “We have urged Vietnamese officials to ensure that Russia is not able to use its access to Cam Ranh Bay to conduct activities that could raise tensions in the region,” he said on condition of anonymity. He added that Washington “respects” Vietnam’s power to make deals with other countries. General Vincent Brooks, commander of the US Army in the Pacific, said there have allegedly been “provocative” flights near the US Pacific Ocean territory of Guam. The planes used for flights were reportedly refueled by Russian tankers at Cam Ranh Bay, according to Brooks. He refused to mention when the alleged Russian flights took place or how many there were, only hinting that it was during the past year. Cam Rahn Bay was formerly the largest Soviet base outside the Soviet Union. The facility previously played a key role in providing support for the Soviet navy, and later for the Russian navy. Thanks to its geographical position as well as favorable conditions, the deep-water port on the southeast coast of Vietnam is considered to be one of the best in the world. In different periods of history it has been used by several maritime powers – including France, Russia, the US and Japan. The port is situated in the province of Khanh Hoa and lies 290 kilometers (180 miles) northeast of Ho Chi Minh City (also known as Saigon). It provides excellent access to both strategically and commercially important routes across the South China Sea. In addition, with the harbor’s depth of about 14 meters, the port's shipyard makes it possible to repair large vessels. From 2011-2014, Vietnam used Russian consultants and bought Russian technologies in order to update and re-open the base. 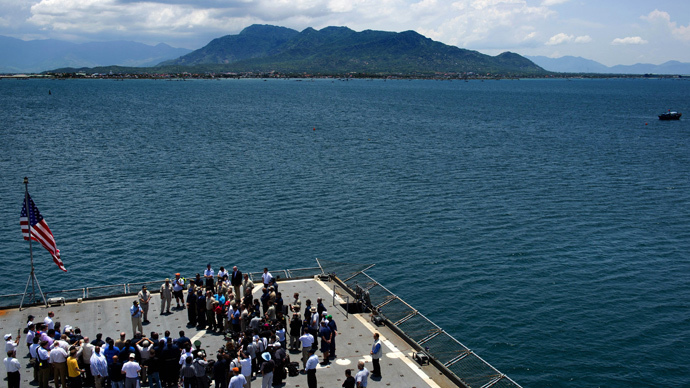 Meanwhile, Washington itself is looking to gain more access to Cam Ranh Bay in order to offset China’s rising influence in the area. In the past, US vessels have been allowed to use the port for ship repairs. The Vietnamese government had no immediate response to the US request. At this point, Vietnam has three submarines purchased from Russia at Cam Ranh Bay, which it uses to counter Chinese influence in the area. Two more submarines are scheduled to arrive early in 2016. The US has been working on improving its relations with Vietnam by offering additional aid packages, including health, education, landlines clearance, bursaries and nuclear energy. Washington even began to ease its embargo on lethal arms, allowing humanitarian exercises. Washington has also stepped up high-level visits to Hanoi. The latest announcement from the US ambassador in Vietnam, Ted Osius, stated that the Vietnamese Communist Party chief will visit Washington sometime in 2015, which will make him the first party leader to do so.